Today, I'm writing about the melodrama Humoresque (1946), starring Joan Crawford and John Garfield. 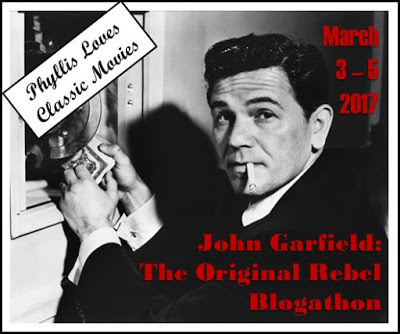 This article is part of John Garfield: The Original Rebel Blogathon hosted by Phyllis Loves Classic Movies. Before there was James Dean, Marlon Brando, and Montgomery Clift, there was John Garfield. 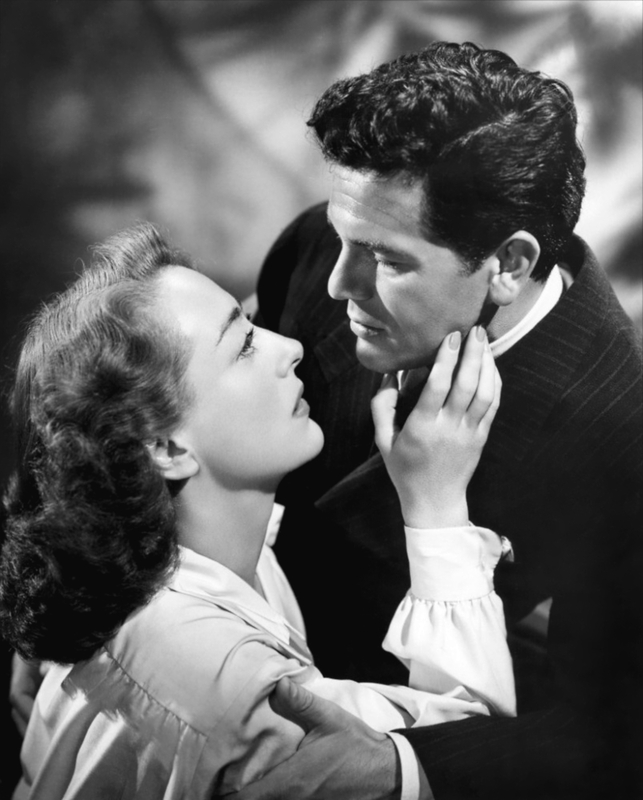 The talented method actor gives a sensitive performance in director Jean Negulesco's melodrama, Humoresque (1946), as a young violinist who is torn between his talent and a married woman (Joan Crawford). Humoresque tells the story of violin prodigy Paul Boray (Robert Blake as a child, Garfield as an adult), who grows up over a storefront in New York City. Paul is very talented, but he has trouble getting breaks in the classical music world until he meets a rich patron of the arts, Helen Wright (Crawford). Helen takes an immediate interest in Paul and begins to sponsor his career, but, despite the fact that she is married to a wealthy man (Paul Cavanagh), she and the attractive young violinist soon embark on a doomed love affair. Writer Fannie Hurst's tearjerking short story had already been filmed once in 1920, but the second version of the film came about quite by accident. Playwright Clifford Odets turned in a draft screenplay for the George Gershwin biopic Rhapsody in Blue (1945) that Warner Bros. executives felt was too downbeat for a celebration of the composer's music. But, rather than throw the script away, the penny-pinching studio chief Jack Warner handed it to producer Jerry Wald as a vehicle for Garfield, who was then a top star at Warner's. Crawford, who was fresh off her Oscar-winning comeback in Mildred Pierce (1945), expressed interest in the role of Helen, which landed Wald a handsome budget and the services of famed violinist Isaac Stern, who played all of Garfield's violin pieces off camera while the actor mimed playing onscreen. In fact, if you look closely, you'll notice that it is not Garfield's hand doing the finger work; instead a violinist who crouched out of camera range with his hand through Garfield's sleeve is making the movements up and down the strings (Pianist Oscar Levant, who plays Paul's sidekick in the film, joked that "the four of us should go on tour together"). John Garfield blows out the candles on his birthday cake on the set of Humoresque (1946) with Joan Crawford, Oscar Levant, director Jean Negulesco, and Paul Cavanagh. Viewed today, Humoresque is a sometimes talky, but still powerful drama that features outstanding direction by Negulesco and perhaps Crawford's best screen performance. The star looks beautiful in her Adrian-designed gowns, but even more, she gives an accomplished performance as a lonely woman who has never been able to find real love despite her wealth and beauty. The film's final scenes, which take place to the strains of composer Richard Wagner's Liebestod (the name means "love death"), is a testament to Crawford's star power and to Negulesco's masterful direction. In fact, Humoresque's melancholy tone combined with classical music and water imagery is somewhat reminiscent of the work of Swedish director Ingmar Bergman. Ironically, Humoresque's story is also quite similar to Garfield's own biography. Garfield was born Jacob Garfinkle March 4, 1913, on New York's Lower East Side to Russian immigrant parents who worked in the garment industry. Garfield's mother died when he was 2, and he was shuffled between relatives in the Bronx, Brooklyn, and Queens where he joined a series of street gangs (he later said, "if I wasn't an actor, I might have been Public Enemy No. 1"). Garfield struggled in school until he was noticed by a teacher named Margaret O'Ryan who gave him speech and acting lessons and encouraged him to appear in school plays and enter dramatic competitions. O'Ryan helped Garfield obtain a scholarship to a drama school for underprivileged youth, which led to his success on Broadway and later Hollywood. I'll leave you with this scene of a tipsy Helen singing, "Embraceable You." The clip also includes one of Joan's best-ever lines, "I won't play second fiddle to the ghost of Beethoven." 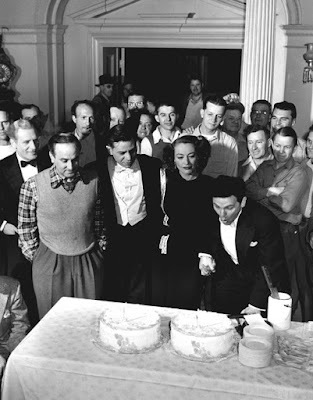 Humoresque will air on TCM at 3:45 p.m. March 31 and at midnight April 21. It is also available on DVD and video on demand. I didn't know about the arm through the sleeve :) I remember enjoying this movie but I really need to watch it again. The performances really are fantastic. Thanks so much for participating in this Blogathon!!! This is a film I have been meaning to get around to for some time. Your article has convinced me to catch one of the upcoming screenings. Thank you so much. LOVE this film! Though Crawford felt that her performance in her next film, Possessed, was her best I think this one takes that honor. It's almost a supporting turn since so much of the focus is on Garfield's Paul but she really digs into the troubled Helen's many complexes. She never would have okayed it at the time but a nomination for Best Supporting Actress wouldn't have been out of line. At first glance Paul Boray would seem an odd fit for Garfield but the script keeps just enough of his rough hewn street toughness while adding in the more sophisticated elements necessary to make the character work. Garfield makes it all work, a very talented actor. And as if the combo of Garfield, Crawford and Levant weren't enough there's all that glorious music to pull you in. I was surprised this movie wasn't nominated for any Oscars, not even in the technical categories. Joan would have been a good choice for supporting actress, but it would have been a blow to her pride. Can't believe I haven't seen this film. (This blogathon has shown that I have a lot of catching up to do when it comes to John Garfield's films!) I know I'll love it. Thanks for providing all the background info, especially the ol' arm-through-the-sleeve trick. ;) Sounds pretty clever. Once you see it, you can't unsee it. It makes him look like he has an extremely long left arm. I also reviewed this movie for the blogathon,. and it's interesting to see how we can have different things to say about the same work. I enjoyed it, and it was nice that you focused on backstage stories and Garfield's life parallels.